Absinthe Liquor, all you need to know about the drink: Absinthe is commonly known under the name the Green Fairy, because the spirit has a green color. It was the notorious liquor of the 19th century, mainly drank in Europe, especially in France and Switzerland. It was legal until the early turn of the century (1910-14). Real Absinthe recipes are based on herbs, which are distilled with neutral grain spirit or wine alcohol. The three basic ingredients of the liquor are wormwood, fennel and anise. Authentic, original Absinthe is distilled and the final liquor has 68% alcohol by vol. This high proof of the liquor is neccessary as only at this alcohol percentage the natural green color of the drink is preserved. Real Absinthe is available for sale at different prices. Let us explain a bit more, what Absinthe (alternative spelling: Absynthe) is all about. First of all real absinthe contains thujone, as it should be made with grand wormwood (artemisia absinthium). The legal level of thujone in Absinthe is 10 mg in the US and 35 mg in Europe. But you will not hallucinate if you drink a glass of Absinthe. Absinthe is NOT a hallucinogenic drug. Not a big surprise, because it is legal in almost all countries in the world, therefore you can imagine, that the global health organizations would never legalize a liquor that is poisonous. The so called "effect" derives from the relatively high alcoholic volume of 60% up (120 proof). Another misunderstanding we want to address in the following paragraph is the proper way of preparation. You should always prepare the ggeen liquor according to the classic Absinthe ritual. This is NOT setting Absinthe on fire. This is inauthentic and dangerous. You should drink Absinthe with sugar and water (no fire). Which means you need an Absinthe spoon, one glass, a decanter / carafe or ideally an Absinthe fountain, sugar cubes and cold water to prepare the Green Fairy the right way. First the glass has to be filled with Absinthe, then you pour cold water into the glass by letting it flow over the spoon. The green liquor blends with the water and the dissolved sugar and your Absinthe glass is prepared once the green liquor has louched to a creamy white color. Sip the milky elixir and enjoy. There are many Absinthe brands for sale. You have to try different Absinthes to find your favorite. The best Green Fairy is always the one YOU like the most. Not the one a so called "Connaisseur" drinks. 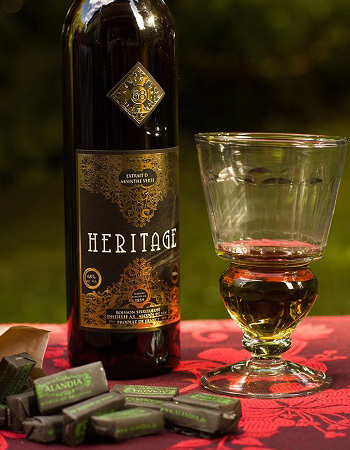 There are macerated and distilled Absinthes on the market. Distilled liquors are of higher quality, smoother from the taste and yes, as well more expensive with a higher price. Absinth is indeed sold at different prices. It depends which quality you are looking for. The minimum Absinthe price for a premium Absinthe is approx. 39 Euro / USD 45. Cheap Absinthe or lets say cheaper brands are often macerated Absinthe. Cheap means in this sense, that the production method (maceration) is less cost intensive, therefore you can find these liquors at lower prices. The price for a macerated Absinthe is approx. 29 Euro / USD 35. These Absinthes are sometimes stronger, more bitter, and more intense from the flavor. They are not as fine as distilled ones. You have to try both. But if you want to enjoy your glass of Absinthe more in the sense of experiencing history and quality, you should buy a distilled one. Distilled Absinthe is softer and easier to drink. Macerated liquors are more for the Absinthe effect seeking Absintheur. Czech Absinthe is mostly macerated, French Absinthe mostly distilled. Have a look at our store, there you will find more info about the specific brands. If you are a US based Absintheur and want to purchase Absinthe, check out our info site: Absinthe USA.